This is one of several properties managed by Bruce with Holiday Rentals Mexico. Make the most of your stay by taking advantage of our unmatched personalized service while enjoying all the comforts of home and more in this 3 Bedrooms / 2 Bathrooms condo in the heart of Mexico City. The owner is a bilingual US expat who has resided in the city for seven years and is on call 24 hours a day to make your stay very special. The apartment is located in the award winning condominium community Puerta Alameda. The complex has door men and security 24/7 along with amenities such as an indoor heated pool and a gymnasium, business center available for guests, a children’s jungle gym play area and more. PRIME LOCATION: The apartment is located in the historic of the city near the opera house Bellas Artes. The area where the complex is located is now considered one of the safest areas in the city (in the last ten year the government and major real-estate developers have invested heavily in the area). The condo is within walking distance, visitors will find the Paseo de la Reforma, Parque Alameda and the Palacio de Bellas Artes, the Zocalo, the Ciudadela Crafts Market and several major museums and attractions. Two subway lines and the Mexico City Turibus line are a stone’s throw away. The Historic Center is has become a vibrant neighborhood with plenty to do during the day and evenings with several trendy restaurants along with entertainment. 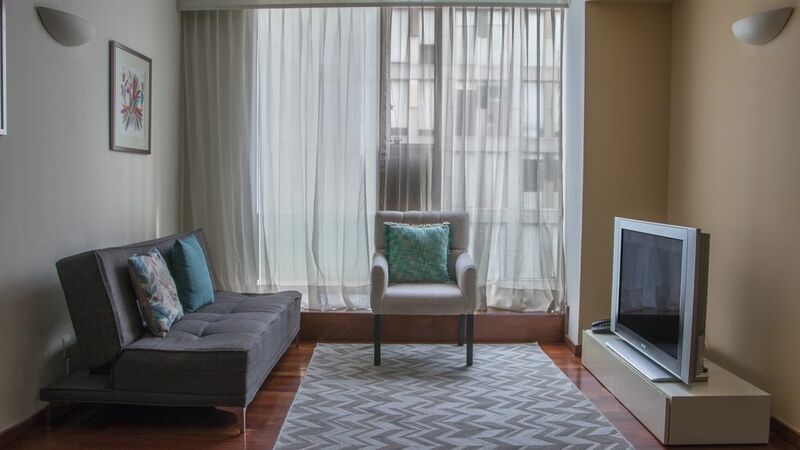 COMFORTS OF HOME: Enjoy all the comforts of home and more in this 3 Bedrooms / 2 Bathrooms condo in the heart of Mexico City. The unit is furnished with new pillow top mattresses, high thread-count sheets, quality towels, drinking water, refrigerator, stove, microwave, dishwasher, coffee maker,cable television. High speed Wi-Fi internet is provided in the apartment. UNSURPASSED PERSONALIZED. The owner is a bilingual US expat who has resided in the city for eight years and is on call 24 hours a day to make your stay very special. Your personalized service starts the moment you clear custom with airport pick-up provided for you entire group for a reasonable fee (optional service). We offer our guest a tour of the condo complex facilities along with pointing out restaurants and grocery stores (a medium size grocery store is only 3 blocks away). A private car service with our highly recommend bilingual driver is available upon request at very reasonable rates. We are also available to assist in coordinating your transportation needs. Flexible checks in and checks out hours are offered whenever possible. COMPLEX SECURITY / AMENITIES: The apartment is located in the award winning condominium community Puerta Alameda which provides excellent security staring with access to the building being limited to residents with magnetic security cards to the enter the building (Magnetic security cards provide to our guests during their stay) . Once entering the building doormen and security is provided 24/7. Luxury amenities for the complex include a heated lap size pools, a full size gym, a rooftop jogging track and sunning areas as well very tranquil patio / garden areas throughout the complex. Also there are comfortable lobby areas with sofas and chair to relax and Wi-Fi access is available. This complex is well located, clean and secure. The only reason I don’t provide 5 stars is because the apartment issued a constant bad smell of urine, mainly from the laundry. If you want a tour of the city, or Teotihuacán, ask for Ricardo. One of the best tour guide I ever met!! Great location and great staff. Super! The staff and location of the apartment are great. The staff were extremely responsive to any requests. Ricardo Ramirez who does tours was fabulous. If you are looking for a great tour guide-one who is knowledgable, easy to get along with, interesting, honest and takes exceptional care of his clients- Ricardo is it. I have used tour guides in other countries who clearly were being paid by souvenir shops whereas Ricardo told us to avoid buying souvenirs at Teotihuacán as they were a rip-off and told us where to go in Mexico City later after our tour ended. He provided an immense amount of valuable information and insight. The location of the property in the heart of Centro was super. The location and reasonable price alone justify this place. Dear Miss Escorcia, thank you so much for your review, we are so glad to know that you enjoyed your stay in Puerta Alameda Suites, and the tour service was for your entire agree, we are so happy to know that our service is on the right way. Fantastic property with great amenities, almost adjacent to the Alameda. Very comfortable for our party of 6, with excellent access to amazing restaurants, and historic sites. We had to find a ride to Toluca at check out, which the property manager took care of. About as hassle free as one could ask for, especially considering we in the middle of one of the largest cities in the world. The property was wonderful. Great location. Centrally located to historical downtown. Security was a nice feature too. I have a great time!